In October 2018 Pope Francis invited the Bishops of the world to Rome for a Synod meeting. The theme of the synod was ‘Youth, Faith and Vocational Discernment’. 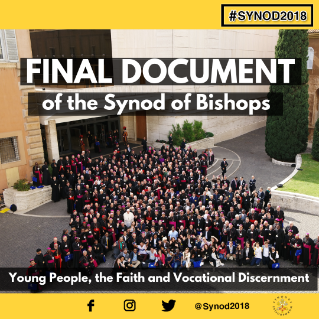 Worldwide preparation for the synod had been ongoing for over a year and included input from young people in Ireland through an online survey, diocesan level focus groups and workshops. Brother Martin Bennett OFM Cap. who is the Vocation Promotor for the Irish Capuchin Friars and Chaplain to St Francis Capuchin College in Cork designed and lead pre-synodal workshops at the World Meeting of Families in the RDS on behalf of the Irish Bishops Conference. The output from these discussions was taken to Rome by the Irish delegate bishops (Eamon Martin and Donal Mc Keown) to form part of the synodal process. Brother Martin recently said that ‘this final document serves as a framework for the proactive engagement with young people today and provides a solid platform for further reflection and discussion. It is a positive step and one that deserves to be used in parishes, schools and communities’.